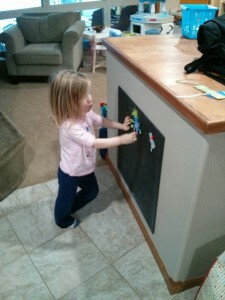 One of the most common therapy recommendations I make for children with motor delays (but is also great for all children), is to work on a vertical surface. Vertical surface? What does that mean? 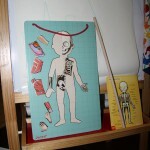 Most fine motor work (writing, drawing, coloring, playing) occurs on a tabletop or the floor- horizontal surfaces. 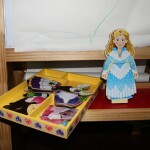 This works great because it is convenient and toys stay in place. However, this position can harm some areas of development by encouraging children to look down, hunch forward, slouch posture, and limit arm movements. By contrast, a vertical surface is something that goes up and down. 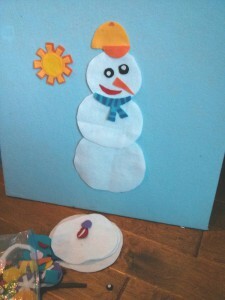 Examples: wall, window or sliding glass door, chalk board, white board, easel, paper taped onto wall, magnetic fridge or board, felt board, and large wall mirrors (if safe). The hard part is that if you try play on a vertical surface, toys fall off. So the activities have to be creative. Suction cup toys or making silly faces in a mirror. 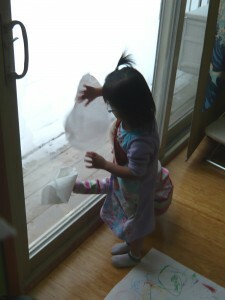 Stickers on a wall, mirror, or paper taped to the wall- just check first they they remove easily. Benefits? 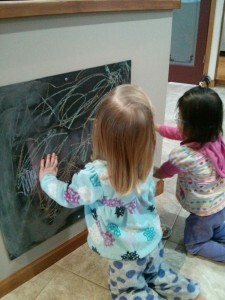 Working on a vertical surface helps to promote gross and fine motor development. The upright posture engages the core muscles (abdominal and back muscles). A child can sit, kneel, half-kneel or stand based on specific needs. It tends to be a larger surface area with more reaching and movement, so the shoulder and whole arm moves to work on strength and coordination. Fine motor skills, such as coloring and writing, tend to develop first as large movements, then get refined to smaller movements. 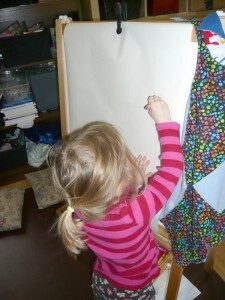 Working on vertical surfaces supports the progression towards dexterity and control. 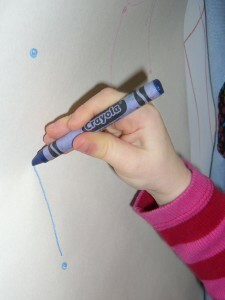 The vertical surface encourages the proper wrist position (slight extension) for grasp and writing development. The upright surface encourages good head and neck position during play, promoting visual skill development such as scanning and tracking. Play on a vertical surface gets both hands working together which promotes bilateral integration and crossing midline skills. 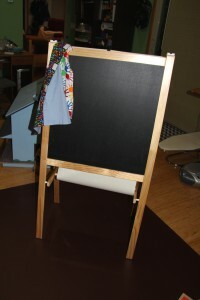 Using a slant board for writing (see this post on how to make your own at home) or a small stand to hold a iPad, book, or paper. 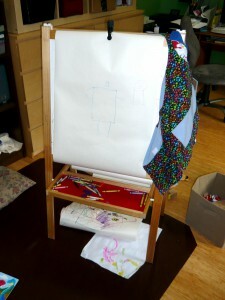 Using an easel to prop up other toys to make them vertical for play to work on posture and arm strength.